There is no fancy technology to get your head around when it comes to microwave drawers. They are exactly that – a microwave in a drawer. However, this practical way of storing a microwave is a fantastic revolution, especially when it comes to kitchen organization. To be specific, we noticed that most people choose these products when they need a microwave in an island. Where do I install microwave drawers? A microwave drawer sits under kitchen countertops like a regular drawer and can be installed flush or proud (i.e. protruding slightly from the cabinet) to your surrounding cabinets. They can fit in well with any design (in an island, peninsula or simply in a regular wall cabinet) and look stylish while making it easier to tend to your food. As there is no swinging door, there are no issues between right-handed or left-handed family members. You can also place a microwave drawer in a corner or next to a wall. 1)	Open the drawer up with a touch of a button when you are ready to use and place your food on the tray. 2)	Close the drawer (with a light tap or using the close button) and choose your cooking time on the touch control panel. 3)	When cooking time is complete, open the drawer and take out your food. Across all brands, there are two sizes of microwave drawer available regarding the exterior width, but the interior measurements are the same. Outside width: 24” or 30” are the main choices 24" being the most popular size. Interior space: 17 5/16” W x 7 1/8” H x 16 9/16” D (1.2 cu. ft) - same for 24" or 30" models. The most important reason for installing a microwave drawer in your home is to be able to save valuable counter or cabinet space. A freestanding microwave can take up around 4 sq. ft of precious preparation space or can be hard to fit into existing cabinets. If you are putting in new cabinetry, then you can incorporate a microwave drawer into the design. Without a rotating plate inside, the inside surfaces are completely smooth so there are no nooks and crannies for food to get stuck in. This makes microwave drawers much easier to clean. Microwave drawers can be installed standing proud or flush with your cabinetry and you can make better use of space by installing under your counter or in an island. There is also the option of stacking with a single oven or warming drawer, so all your cooking appliances are in the one place. Taking hot and heavy plates out of a microwave that is up high is an accident waiting to happen, but as a microwave drawer is lower, you will be able to see better and have more control. Microwave drawers have a child lock, so even though they are on the height level of your child they will not be able to tamper with it. But wait... does a microwave drawer have the same features as a conventional microwave? As the pioneer of microwave drawers, Sharp supplies all the vital components that other manufacturers use in their appliances. With a larger range than any other brand comes more options to suit your needs. PRO TIP - Make sure to contact our staff at (888) 714-4938 to inquire about unpublished savings on Sharp microwave drawers. If you already have Bosch appliances in your kitchen, then the beautiful design of a Bosch microwave drawer will fit right in. When you purchase a suite of Bosch appliances from us you can receive a 10-15% rebate depending on the configuration. Thermador have a great 1-2-Free rebate program where you can get a microwave drawer for free with a qualified package order. A Wolf microwave drawer will match well with your existing Sub Zero/Wolf appliances and comes with an excellent warranty. 2-year full warranty and 5-year limited warranty for electronic control boards and magnetron tubes. Contact us for best prices on our Wolf Models. Viking has been featuring a popular 1,000 Watt microwave drawer for the past few years VMOD5240SS and it comes with a full 2 year warranty and a 5 year limited warranty for magnetron tubes plus an amazing 90 day cosmetic warranty. Might be a good idea for Viking to give a facelift to the product to match the streamlined look of Sharp and other competitors. Monogram Microwave Drawer ZWL1126SJSS has a great price point and complements the greater product line. A microwave drawer is a great investment to streamline the overall design of your kitchen. While you will pay a bit more than a regular microwave, the ease of use and ergonomic benefits are worth it, and it will add value to your home should you decide to sell in the future. With some manufacturers offering a free microwave drawer or a money back rebate when purchasing their appliance packages, it’s a great incentive to include one of these fantastic products in your kitchen plans. 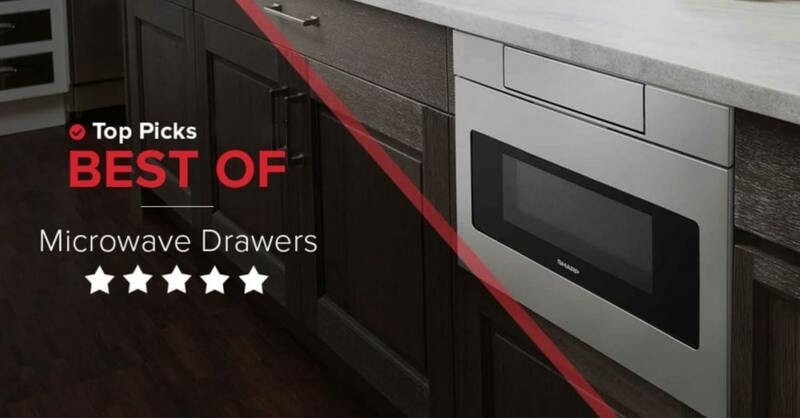 At Designer Appliances we offer many microwave drawer models at different price points and our team are here to help should you have any questions. You can find all of our microwave drawer models in our online store and we happily deliver nationwide. Are Microwave Drawers Worth It? A typical microwave drawer costs approximately $999. A typical mid-range, highly rated built-in microwave such as the Frigidaire Professional FPMO227NUF costs $399 and it needs to be integrated with a trim kit which typically costs $149 for a total of $548. Considering you will not be able to install a built-in microwave under a counter or like a drawer in island the premium is less than $500. Also, keep in mind that some manufacturers offer savings towards microwave purchases in order to encourage kitchen appliance package sales.